There have been many exciting developments in the field of psychology and healing over the last few years. I have decided to start a blog in order to share some of the things I have been learning and am excited about. I was at the pet store recently and happened to notice something hanging on the shelf. It was an Anxiety Vest for dogs. It caught my attention because I had never seen or heard of anything like that. My mind immediately went to Temple Grandin about whom a HBO special was made. 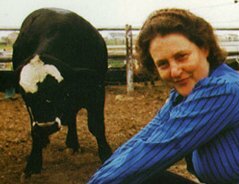 Temple Grandin is the autistic woman who designed humane slaughterhouses for cows. She spent time on her aunt’s ranch and saw how nervous the cattle were and that they seemed to calm down when they were in the squeeze chute, a piece of equipment which squeezed their flanks. She tried it on herself and discovered that it helped her to calm down as well. She then built a machine like that for herself. Temple describes herself as very much like a prey animal in the wild. The world is a scary and unpredictable place for her and she is always alert and hypervigilant. Her struggle with her own overwhelming anxiety led her to her discovery of how much she had in common with cows. The physical holding was calming and relaxing. It seems like the anxiety vest provides the same kind of calm and safety as the squeeze chute. The website states that it helps with fear, anxiety, hyperactivity, insecurity and shyness which manifest in anxiety related to separation, thunderstorms, fear of people or other dogs, aggression, constant barking, nervousness and leash pulling. They say that it helps shy dogs, fearful and hyperactive dogs. Having been trained in and using Somatic Experiencing for the last 8 years, it is exciting to see how much this awareness about the fight, flight, freeze response is an ancient part of the nervous system of dogs, cows, and humans. Having autism makes that connection even clearer, at least for Temple. But we all have the fight, flight and freeze responses stored in our bodies from experiences that we never fully healed or moved on from. Developed by Peter Levine, somatic experiencing is a body oriented psychotherapy. Next time: some thoughts about horses and equine therapy.